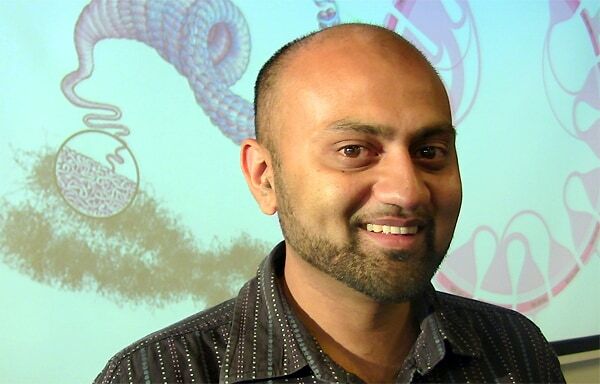 When University of Sydney PhD candidate Kenny Sabir isn't composing music he is deconstructing chromosomes. The musician and information technologies student won the University's Three Minute Thesis finals held on the weekend with his presentation on understanding chromosomes' structures. A simple explanation of his thesis project Visual analytics of the chromosome structure won Kenny the challenge. As part of his PhD research Kenny is studying the complex structure of chromosomes using the best computer in the world, our brains, he explained. He believes the human brain has the ability to recognise complex patterns quickly and, by visualising the structure of the chromosomes, biologists will be able to see patterns on how the genome operates. "Biologists could also see differences between a cancer and normal cells, helping them to understand how cancer works, " states Kenny. An overpowering fascination with biology, bioinformatics and next-generation genome sequencing lead Kenny back to tertiary studies. He left a successful career in IT research and development to join the Garvan Institute for Medical research where he is working with the Sean O'Donoghue's Biodata Visualisation group. "It became clear to me that complex problems in biology required computer science expertise to deal with the massive amounts of data being generated. Bioinformatics is where the exciting problems in computing lie, " he says. "The study of the chromosome structure is a relatively new field and scientists are still working out the best ways to gather the data, let alone how to comprehend it. " "We are looking at a new way to combat cancer. All of us are complex machines that operate on a set of instructions written on two metres of DNA. Over the past five decades scientists have been analysing DNA as a long string of information. A DNA string is so thin that it can be squished into every cell nucleus of your body. Kenny says his experience of live performances with his band 'The Herd' helped with his confidence in public speaking. He also says understanding music composition helps explain the problem. "We can understand form and structure in popular music, as verse, chorus and bridge. When looking at the genome it is like all we are seeing is unstructured random notes, and my work is to try and figure out an overarching form to how the chromosomes work. "Just like a chorus has a purpose, I want to find the purpose of the different sections of the genome."